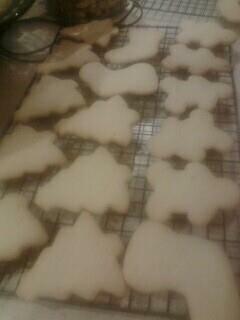 Ok, so some of you may remember this year’s Christmas cookies, or my first Gluten Free Christmas cookie experiment. Thankfully there were only a couple of batches that went to the birds (literally). If you are gluten free, then you know sometimes cooking gluten free is a bit of an experiment. Especially if you’re like me and tend to make up your own recipes. Thankfully, in the last year, there’s only been one meal that I would consider inedible. And hubbyman still ate it. After the first cookie flop and my heart sinking to my toes (it’s a yearly tradition that I have done since being a little girl.). I mean like real disappointment. Not only are Christmas sugar cookies a tradition, but the kids and I love to make them during other times of the year. Dinosaurs and trains are not just for Christmas! So I needed to figure out how to make them work! I opened a million and two windows of baking gluten free tips and read and read and read… and picked a couple things and decided to go from there. Thankfully, the next batch turned out perfect. I’m not sure what exactly made them go from flop to perfection, but I am so glad they did! 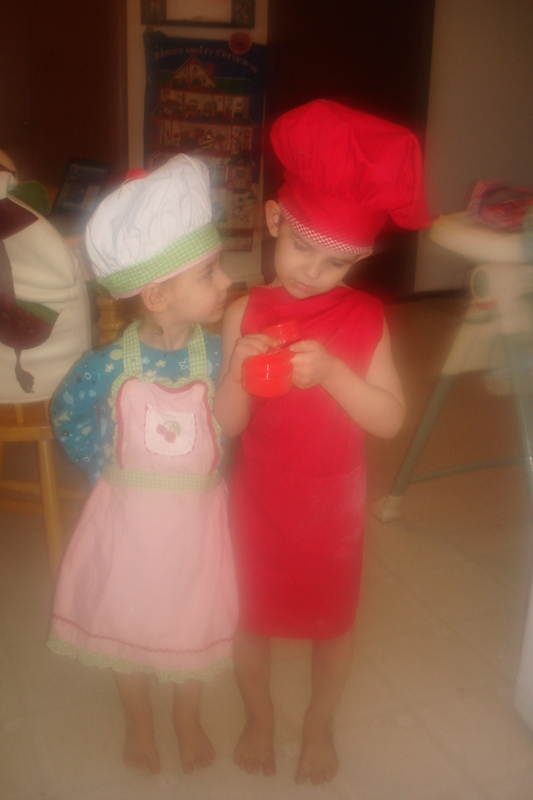 So, if you’ve been looking for a fun cooking expedition to go on with your kids- this is it my friends! If your household does wheat/gluten then by all means use any old sugar cookie recipe! If you’ve been looking for a good gluten free recipe- here you go! Ok, let me preface this by saying that these do take up some time, say an afternoon, or an evening. That said, they are not difficult to make. 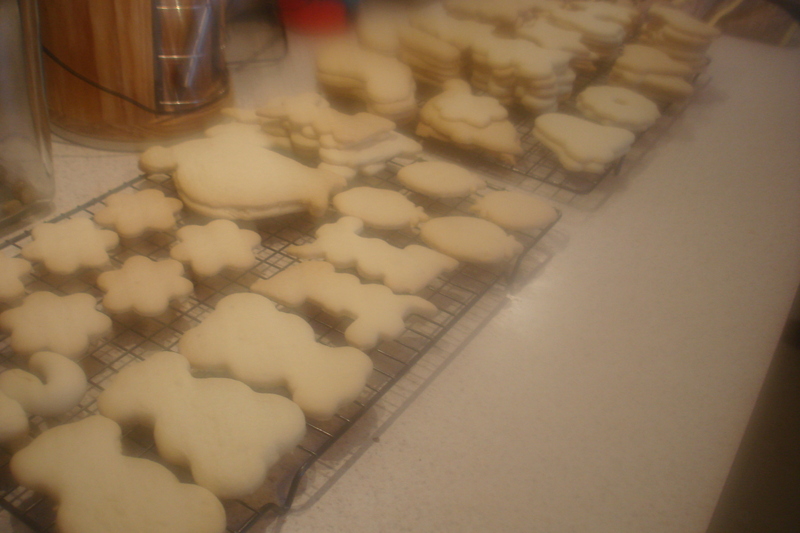 Really, the kids have so much fun with the cut outs and decorating… we made three batches this year! Beat powdered sugar, butter, vanilla, almond, and the egg. (With an electric mixer or by hand) And then stir in the remaining ingredients. Cover and refrigerate for at least 2 hours. I wrapped it in saran wrap and put it in the freezer for an hour. I put away all the ingredients and did kitchen clean up, by the time I was done and the oven was hot, it’d been an hour! Divide dough into sections. I just grabbed a size that looked like a snowball to me (apparently I really am a northern girl). I kept the rest of the dough in the freezer. Roll out until the dough is about 1/4 inch thick, on a lightly floured surface. And then cookie cutter time! Sprinkle with granulated sugar or leave plain to frost and decorate! Note: It really seemed to make a difference that I kept the dough in the freezer in between batches. Especially after being rolled out and cut, the dough then gets really soft and squishy and you don’t want the flat sheets of flop that I made- so keep ’em cold! If you’re needing a frosting recipe, all I do is take about a cup of powdered sugar and add one tablespoon of milk. (That was really technical, I know.) Mix. Add more powdered sugar if it’s too runny and more milk if it’s too thick. You can always add food coloring as well. And then decorate with sprinkles or whatever your heart desires- before the frosting sets! *Sorry the pictures are not terrific… my lens was dirty and I didn’t know until it was too late! Hubbyman cleaned it, so here’s hoping for some better pictures in 2012! I was sooo excited that my favorite all-purpose (Gluten free) flour came in the mail in time for Christmas cookies! No matter how I feel, or have felt, about this season, I always make Christmas cookies. When I was pregnant with Biggest E, Christmas was just a couple weeks before my due date and I was in full nesting mode. I made cookies until every single surface in my kitchen and dining room were covered in cookies. I sent some in with hubby to work, I sent some to a friend in Iraq, I even sent some home. I brought them into work, and I gave them to everyone I knew. There were that many. And in the years since, I have continued to make them by the tin full. I even collect cookie tins just for this purpose. Well, this year I was excited to find another GF family to exchange cookies with! So I set out to make my traditional sugar cookie cut outs and to try my Grandma’s famous recipe (seriously, we’ve all tried copying it, but no one’s ever taste just like Grandma’s!) for molasses cookies. I know this doesn’t sound like a feast, or something to turn into a blog post, but here’s the catch. We’re a gluten free household (no cooking with gluten in this house. period.) and this is our first Christmas gluten free. January will mark a year gluten free, and really in the world of cooking, one year is not that long. So while I feel I’ve mastered lots of different ways of cooking and have gotten my family to try (and enjoy!) lots of new things, baking is always touch and go. 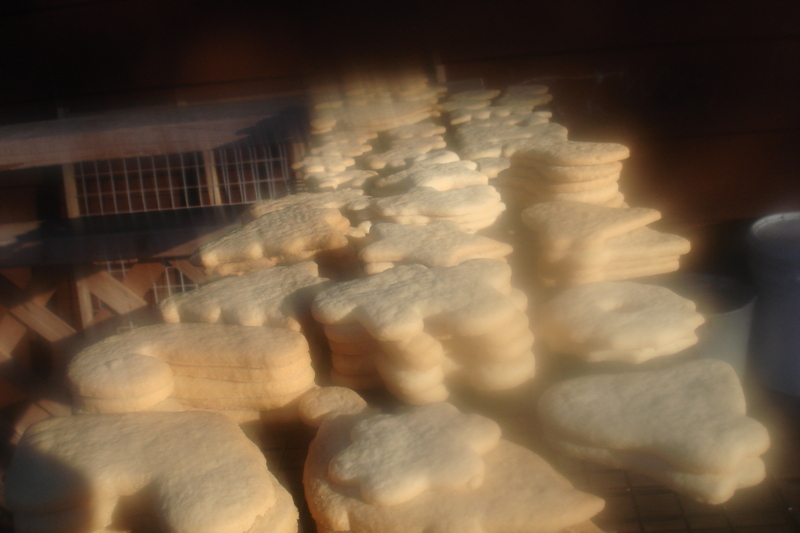 I’ve made some cookies and some cakes with some success, but nothing exceptional. And baking has never really been my thing, even before going gluten free. So enter a world with whole new flours, and gums, and weirdness… but me being me, I just expecting it to turn out. Enter my first batch, the molasses. Flop. They tasted good, but did not look good. These were definitely not the puffy, chewy goodness my grandma makes. More like ginger snaps than anything. So I tweaked it a bit and threw it in the fridge to chill. Then they turned out. Not quite the same as Grandma’s, but waaay better than the first batch! And three cookie sheets in, I think they’re started to taste more like Grandma’s! 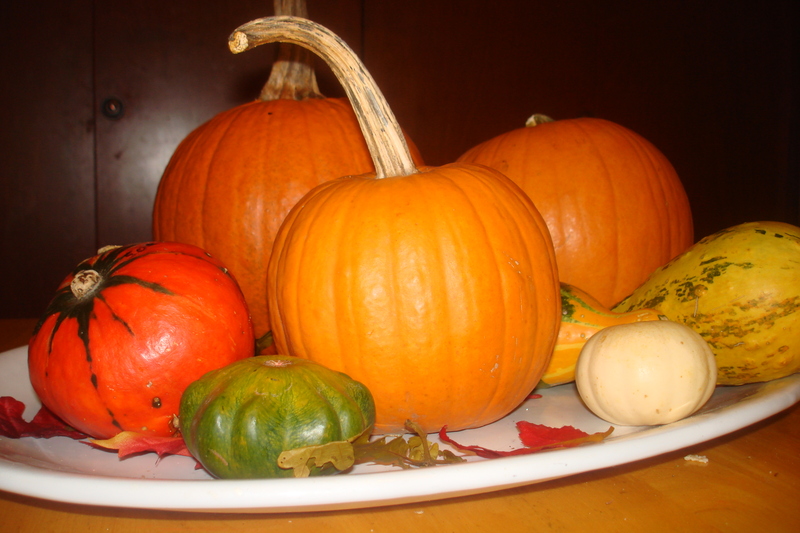 These are some of my seasonally favorite foods: acorn squash, sweet potatoes, and pumpkins. Last week I made sweet potato mash (1/2 sweet potatoes, 1/2 regular potatoes) as well as maple acorn squash (just cut it in half, pour in some maple syrup and bake for 1 hr @ 350). Sooo yummy. Up next? Pumpkin butter and roasted pumpkin seeds!!! Never tried pumpkin butter? It is seriously delicious! I love all things apple and that includes apple butter. 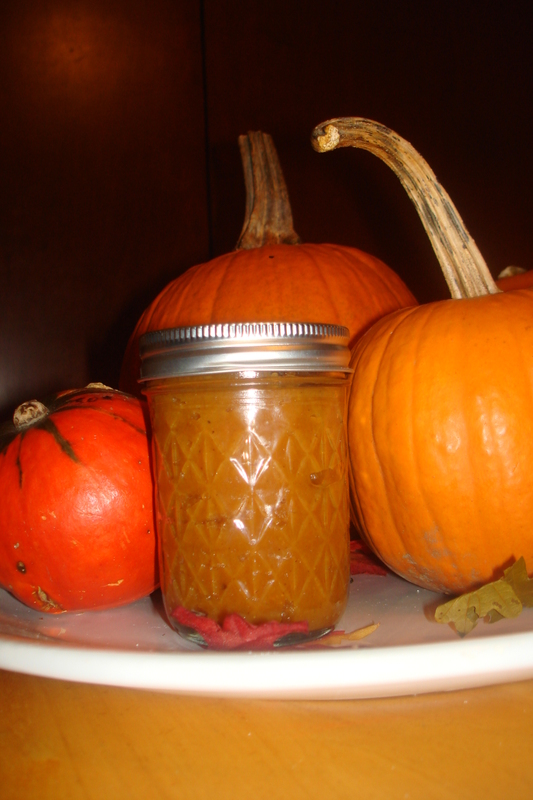 But every time I’ve canned pumpkin butter, I am out in no time…and I always have some apple butter left. So that’s sayin’ something! Plus it makes such a fun gift too! I may make it tomorrow… in my crock pot. Which works famously if you have a busy household (and really, who doesn’t?! If you don’t, I’m sorry, but I’m just not sure we can be friends.). I’m actually sad that I didn’t get more sugar pumpkins (or pie pumpkins) before the farmer’s market ended. Sadly, we missed the last week because Littlest was not feeling good. Boo! Hiss! On seasonal allergies and the genetics he gets it from (mine!). Anyways, just in case you felt like making something extra special, I am going to share my recipe with you! It’s really easy (and you can even used canned pumpkin puree which makes it basically a dump-everything-in kind of recipe!)! *Clean pumpkins, cut in half, and deseed (but save them for roasted seeds!). Cook pumpkins (microwave, steam, or oven) until soft and gut. Throw in the crockpot with the rest of the ingredients over low for about 6-8 hours. If you like a creamier texture, throw it in the blender. And if the consistency is too thick (especially if you used canned as fresh is a little runnier), add in some apple juice/cider. And if it needs more of a certain spice, you can add it in! Want to make more? For 6 qts. use 5-6 pumpkins and double everything else! Can, bottle, freeze, whatever…. 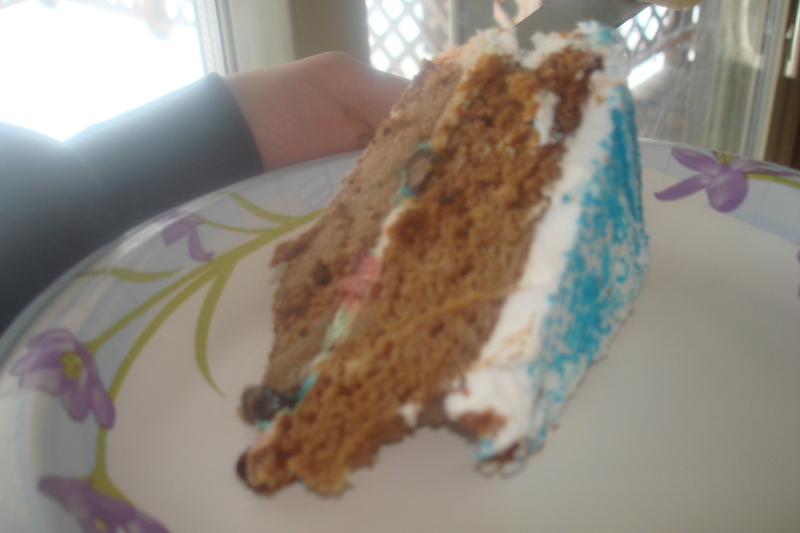 it is incredibly delicious! This is so, so yummy (and so, so simple)… and those that know me that this time of year is a busy time in my kitchen. Salsa making and canning will occur and end shortly and then the fall season will start. Which brings apples galore! My grandparents have an apple orchard and lots of friends with apple orchards. Which for me, equals- I get lots of apples! 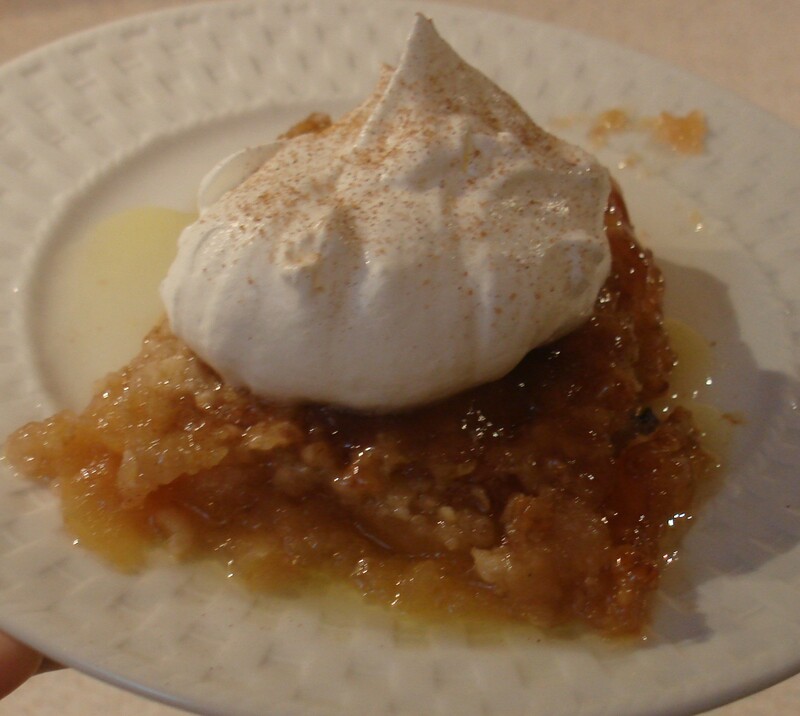 I make (and can) applesauce, apple butter, and send hubbyman to work with countless batches of one of my personal favorite treats- apple crisp! It’s actually one of the few desserts that I can make a whole pan of and not have to throw any out! (We’re just not big dessert eaters, hubbyman and I.) Plus, this is one dish that always says home to me. And have always made it no matter where we lived! Next (this is the topping) you will combine 1 cup of flour (you can also use oats. I used too many oats/not enough flour… I think a 3/4 c flour to 1/4 c oats would be a better consistency than my half and half- but it still tasted good. 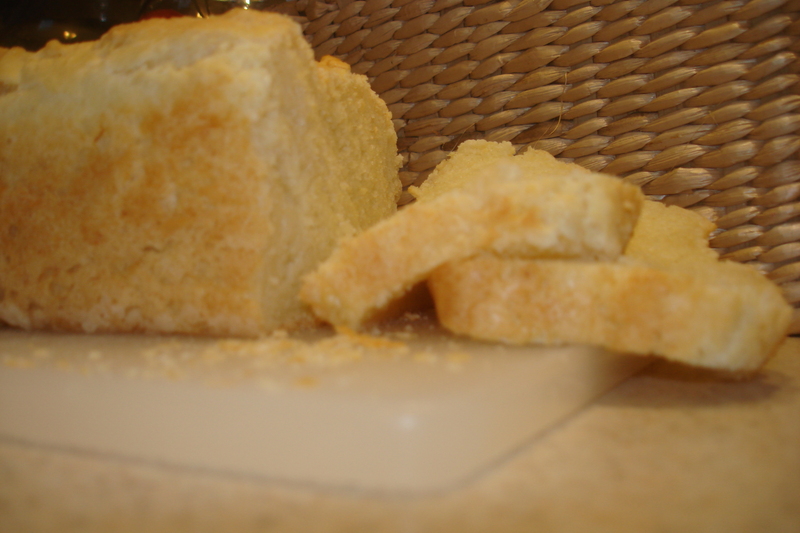 ), a cup of butter (2 sticks), and 1/3 cup of sugar in a small bowl. I usually start with the butter and soften (not melt!) and then “cut” the butter into the flour/sugar, (Which means I take a knife and fork and act like I’m literally cutting it) until it’s in about pea size balls. I love the topping so I make sure that it covers the whole thing. Top it off with cinnamon and bake at 375 for 35 minutes. And voila! You have an amazing dessert! Serve it hot and top with vanilla ice cream (especially if you’re trying to impress someone!) or cold with a dollop of cool whip! Yum! So blah, blah, blah…I usually enjoy cooking, and I still have been cooking, just kind of thoughtless, easy, throw something together because I have to feed my family, kind of cooking. And while I didn’t make the eggplant chicken alfredo that I’d been planning to make, mainly because hubbyman wasn’t coming home until 7ish and I let the kids choose what they wanted for dinner. Which was phone noodles (what they call elbow noodles) and “the red sauce we like.” And can I just say what a relief it is to be able to give Miss E things with tomatoes in it again?! Whew! That poor girl! Her list of can’t haves is finally dwindling down to just a few! We’re still in the reintroduction phase, so we’re taking it slow and minimal, but so far so good! 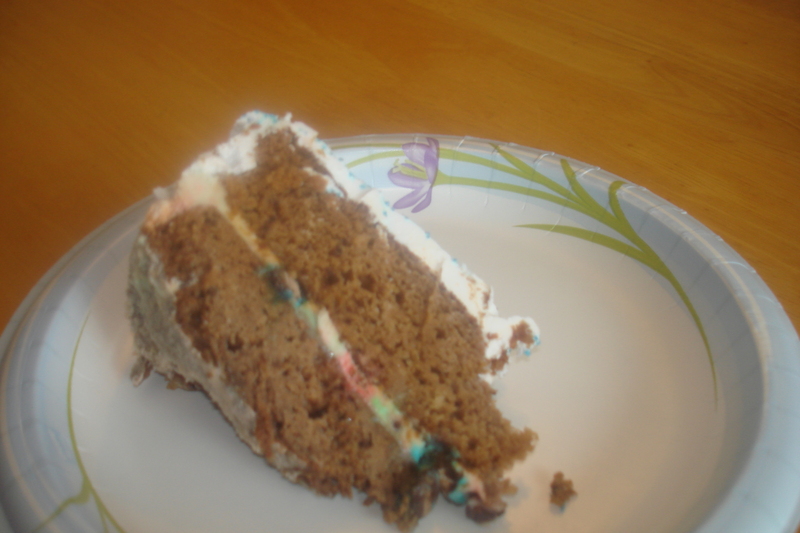 I made the frosting pink for Miss E since lots of times she gets left when it comes to deserts. They were both phenominal! I was so impressed! Plus, I had everything I needed on hand… I guess I did a couple substitutes, but I didn’t have to run to the store for anything and they turned out great! 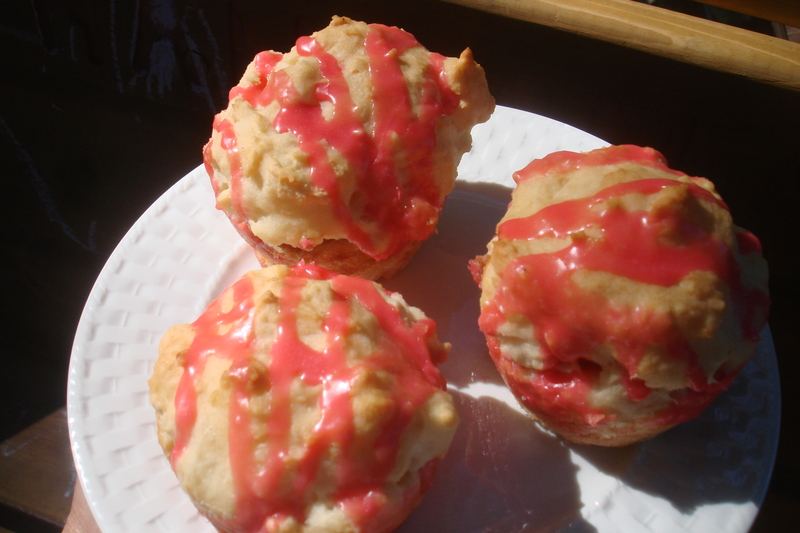 If you want to try them, go here for the full recipe! Notes on how mine were different: I made one batch of dough and filled one bread pan and then had enough dough left for 6 of the cream cheese rolls. Favorite Rolls: Not only did I turn it into bread, but I didn’t have potato flakes, so I googled and found I could substitute potato flour or starch (1/2 cup flakes = 3 cups flour). I also didn’t have buttermilk, so I made my own (1 tbs lemon juice, add milk until it equals a cup. Let sit for 5 minutes. Viola!). Also since it was bread, it needed about 30 minutes. This was SO good and really very simple! Cream Cheese Rolls: Oh this filling is so good! I made the whole batch and put the rest in the fridge- I’m thinking stuffed french toast this weekend! Or pancakes! Oh yum! So good! Anyways, you do want to make sure to push the top layer (of dough) down onto the filling, or yours will turn out like mine- with a little bubble in the middle that’s not completely filled with filling. Still good, just not quite right. And the topping, I didn’t have almond, so I just used vanilla. And I, of course, made it pink. Because my little girl hardly ever gets to partake in “deserts” and it was a way of making them special for her! She was so pleased! GF and craving cinnamon rolls? If you’re not making the rolls/bread too, and only the cream cheese rolls, then I’d highly recommend throwing some cinnamon into the roll’s dough and if it were me, I’d throw in some almond or vanilla too. I know there’s not a lot of sugar in the dough, but I don’t think it needs more, the filling is so sweet, that it’s good without more. Definitely making these again! Yum! 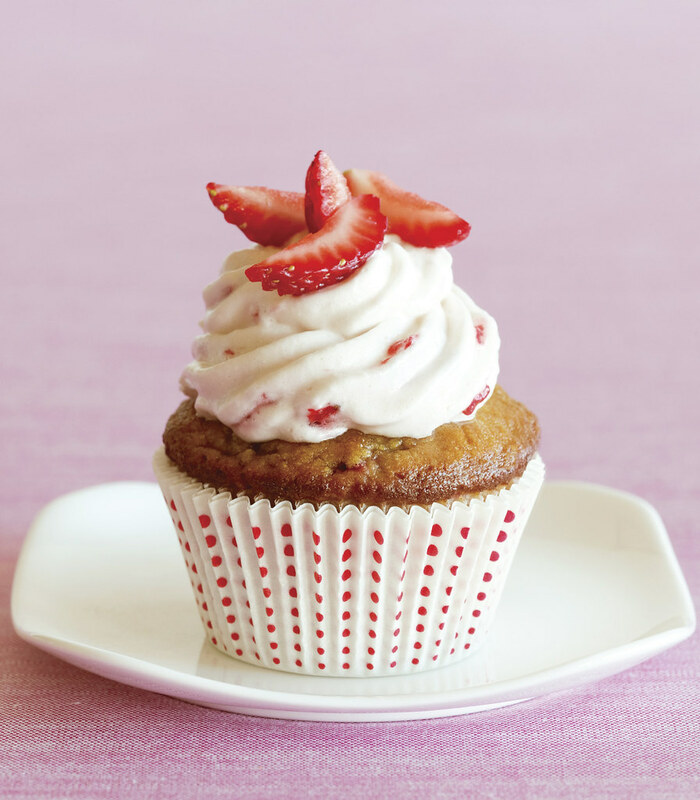 Bake for 20 to 25 minutes, until a toothpick inserted into the center of a cupcake comes out with just a few moist crumbs attached. Let the cupcakes cool in the pan for 1 hour, then frost and serve. *How I make it my own: Sub xantham gum and corn starch for the arrowroot. And agave nectar for honey. (I might also try substituting it with stevia) Both those changes were mainly because I like to use what I have without adding a trip to the grocery store. I’ll also throw in an extra 1/2 tbs of vanilla- because my dad brought me back a delicious bottle from Panama (thanks Dad!) and it’s so good). And because of the extra vanilla I’ll throw in a pinch of almond flour (plus if you’ve read any of my other recipes, you know I love almond flour). It’s not super sweet, so it makes a good breakfast muffin too! (Under the disguise of a cupcake! The kids will love that!!) For breakfast version I’ll fold in some strawberries into whipped cream, but any whipped frosting (or even a cream cheese frosting!) would taste really yummy!